Although the newly launched iPad is a clear step forward in terms of visual quality and processing power it fails to revolutionise the crowded tablet market. It has led to more rumours that the company has lost its creative direction since the departure of Jobs to God’s Own IT Company in the sky. Apple have denied rumours that their recent recruitment strategy has switched from finding the brightest and best engineers and programmers to one centred around mystics, psychics and anyone with a talent for using ouija boards. U.S Air Force – Please Anonymous give us back our space plane! I agree, he isn't even wearing a turtle neck! 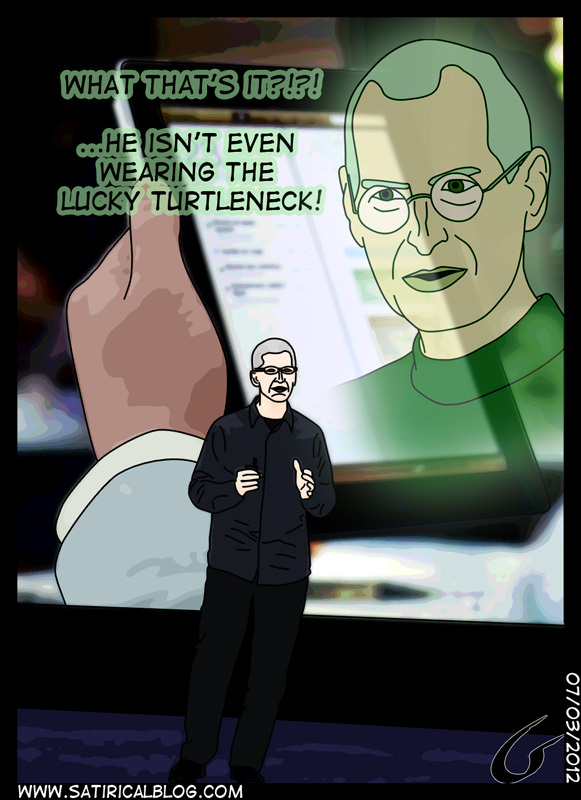 Wearing a turtle neck brings good luck to Apple! Surely all you need is a crazy man in a turtleneck sweater talking about how amazing the overhyped product is? Maybe it's just the delivery of the iPad. It's always been Apples job to sell you something you didn't think you needed or wanted and they've been very successful at it. We'll see what the bottom line looks like on this one. I want to see the numbers when they come in. I love my IPAD for reading, but it is so limited on anything else that I really just use it for downloading books. I put a turtleneck on my iPad. They already have most of the monopoly on the tablet market, so just a new, slightly improved product is more than enough. Fuckasses. Apple lied. I work for them now. I am an expert tarot card reader. i loled at the last comment. steve jobs was the heart of apple. Some people aren't happy with the IOS system seemingly…. hilarious! Steve are you out there? Even with the third release of the iPad, it is still remarkably similar to the original one. I think they are going to need to think of an entirely new device in order for people to stop doubting them about the loss of Jobs. Until then though, we shall struggle on wishing he were still providing us with his creative genius! Look like a good time to start selling your stock in Apple before it drops. I'M CALLING IT, APPLE'S GONNA TANK AT THIS RATE. RIP APPLE, THANK GOD I NEVER BOUGHT YOUR OVERPRICED SWILL. I think their main power was making everyone believe that what they just created is new and revolutionary. I think they kinda failed at this with both the Iphone and the Ipad.. The battery life is still longer than that of their competitors. If no one is going to push Apple to come out with a better product why would they?